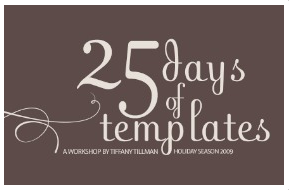 I cannot even begin to express how excited I am about Tiffany Tillman's newest online workshop at reneepearson.com: 25 Days of Templates. OK, I admit I might be just a *tad* bit biased because I am on the Design Team for Paislee Press who designed this exclusive digital kit for the class. Wanna see? In this class, Tiffany will help you craft a holiday album using her beautiful layered templates as the foundation. If you want a stylish album but don't want to stress about it and/or you don't have a lot of free time to create, this class is the *perfect* solution. I think I need this class. Pronto. With Tiffany's fabulous templates at my fingertips, I can put together pretty layouts very quickly and then sit back and fully enjoy the holiday festivities. Bring on the hustle and bustle, I'm ready for you this year! Ready to see some layouts I created with just two of Tiffany's templates + the adorned kit? And here is a second template I used for a layout about my recent trip to New York City. Tiffany has so generously offered to give away a spot to her class! To enter for your chance to win, simply post a comment on this post on the PAISLEE PRESS BLOG. You have until Friday, November 13th at 11:59 pm (PST) to enter. You can get an extra chance to win if you tweet this. Be sure to come back and post a link to your tweet in the comments section of the same post on the PAISLEE PRESS BLOG. The winner will be drawn at random and announced here over the weekend and announced on the PAISLEE PRESS BLOG. Oh my, I love the LO, "She Sleeps"!! I've never done a digital class. This would be so great. I would love to win this digital class... looks like it is just my style =). My name is Diana Matos I was browsing internet and found your blog. The author did a great job. I will subscribe to your RSS feeds. Thank you for your contribution. I am a web designer myself. And here some examples of the websites that I designed for payday loans canadian payday loans company.